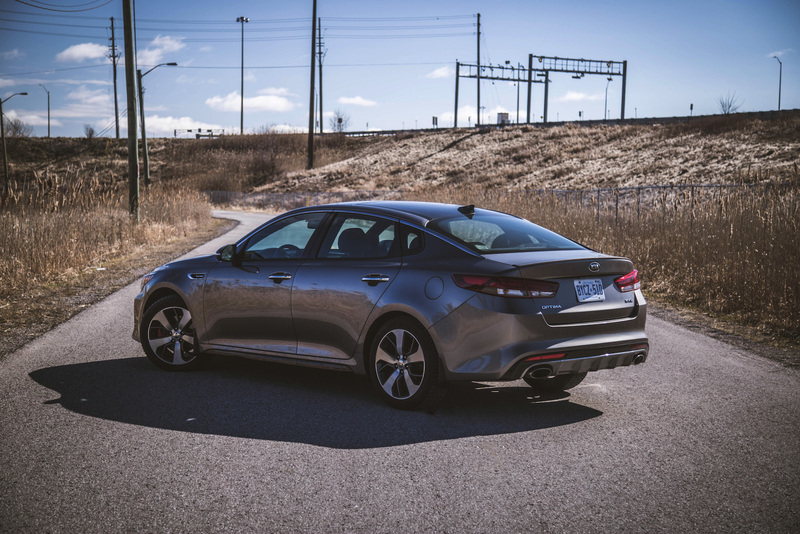 “Value, value, value, this Kia Optima is packed with so much value!” I exclaimed to Maxime Surette, the Product Communications Manager for Kia Canada. He replied back excitedly, “That’s our motto!” It was obvious I was a little more surprised than he was. 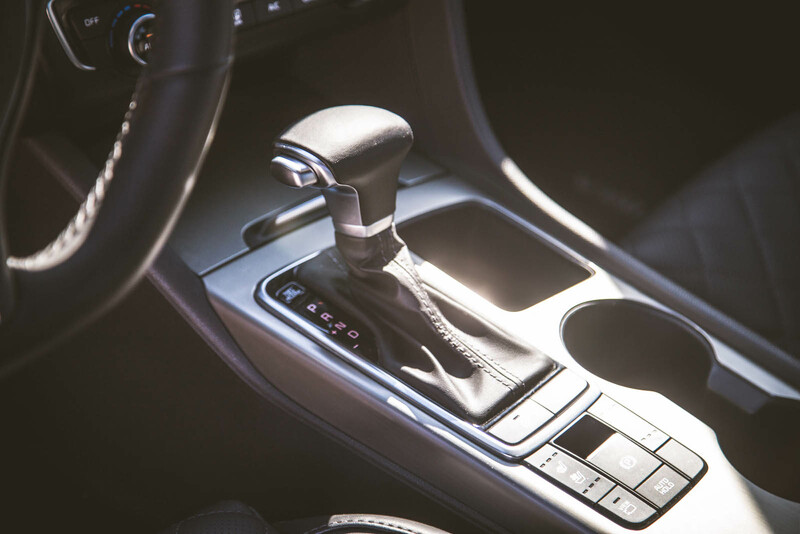 When I snatched the keys to a redesigned 2016 Kia Optima SXL last week, I was expecting little more than a dull mid-size sedan that ticks the affordability box but leaves the “fun” and refinement” boxes empty. Boy, was I wrong. 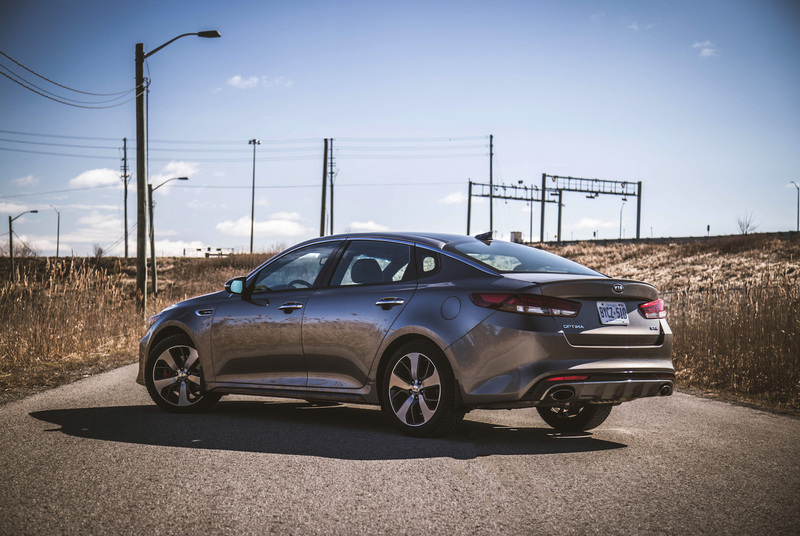 Arguably Kia’s most important vehicle of the decade, the new Optima is loaded to the elevens with luxury options at a fraction of the price. In fact, we kept mistaking the expansive standard features list as the options list. 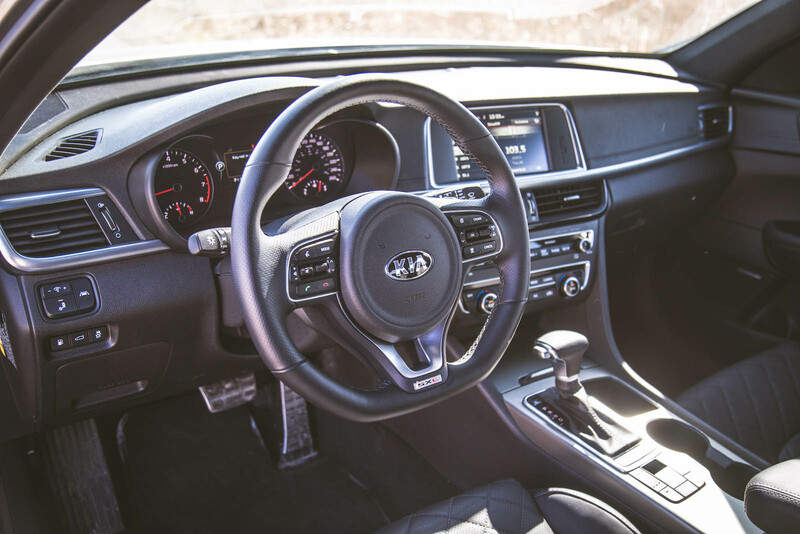 Now roomier and more luxurious than the outgoing model, Kia’s revitalized tiger-nosed sedan is aiming to set the standard for youthful and value-oriented design in the mid-size sedan segment. For 2016, Kia has stretched the wheelbase by 10 mm and widened the vehicle by 30 mm, offering more headroom, shoulder room, and legroom for every passenger. The trunk has also swelled up by an impressive 14 litres. The 2016 Optima doesn’t look much different from the car that has been on sale for the last five years, but the new face comes off sharper and more taut, and I quite like the lower stance. Every year it seems the Optima looks less like a bargain and a more like a proper sports sedan. 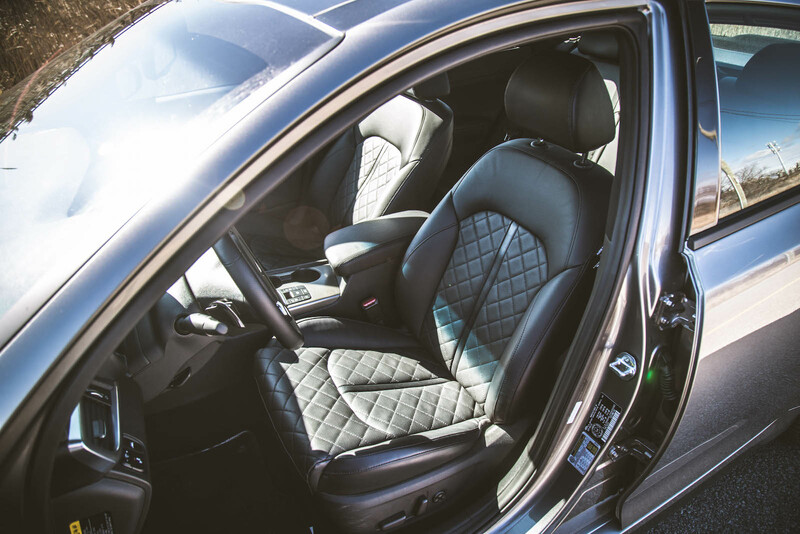 Once we hopped inside, beautiful quilted Nappa leather seats caressed our bottoms and a simplistic design soothed our eyes. We noticed a few Teutonic elements in here too with the sporty flat-bottom steering wheel loaded up with expensive feeling paddle shifters and leather trimmings. The dashboard-integrated center display looks exceptional – clean and clear – unlike screen setups that garishly pop out in other vehicles. 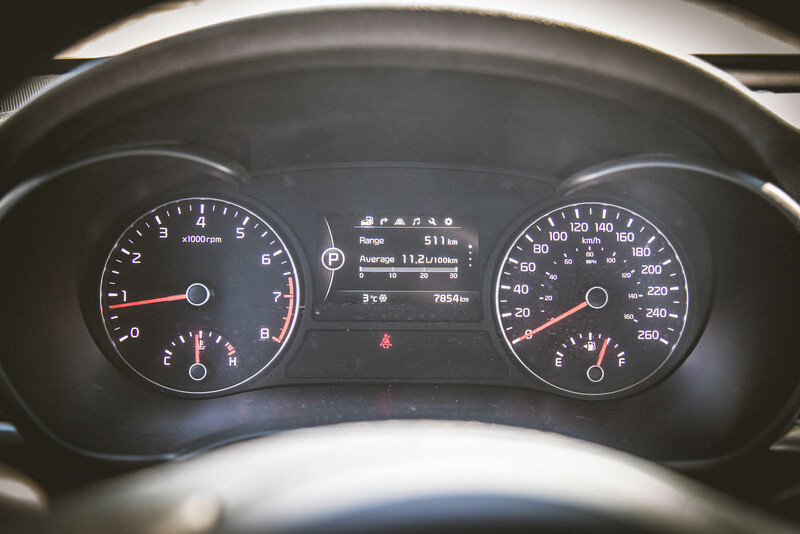 The double-stitched dashboard looks great, and the liberal use of black plastic mainly goes unnoticed. 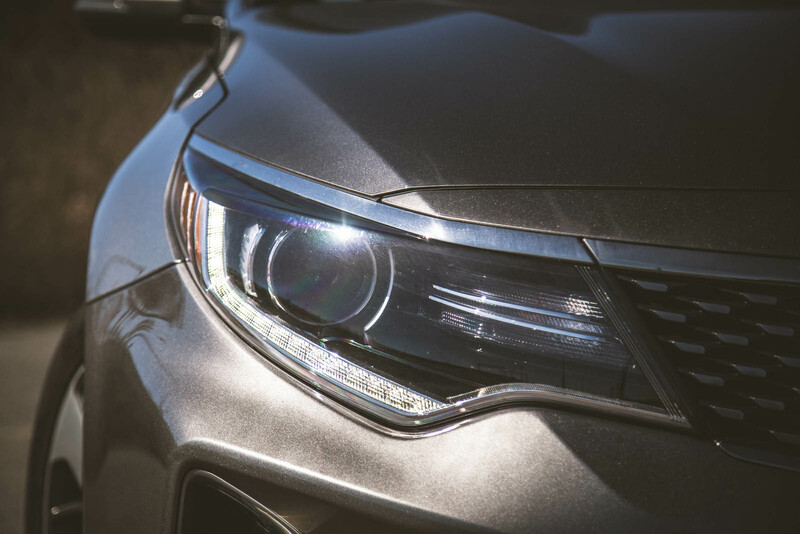 Special attention has also been given to many minute details, things we take for granted, such as the Optima’s windshield wiper display that tells you whether you’ve put the stalk in Off, Auto, Low, or High on the LCD screen in front of the driver. We’ve driven so many different cars that we’ve run out of patience to read the tiny scribbled font on the stalk, so it’s actually nice to see a live read-out. The things we’re easily impressed by, eh? 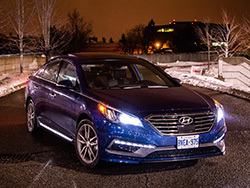 In all, it is a stylish cabin that unsurprisingly resembles its Korean sister, the Hyundai Sonata. 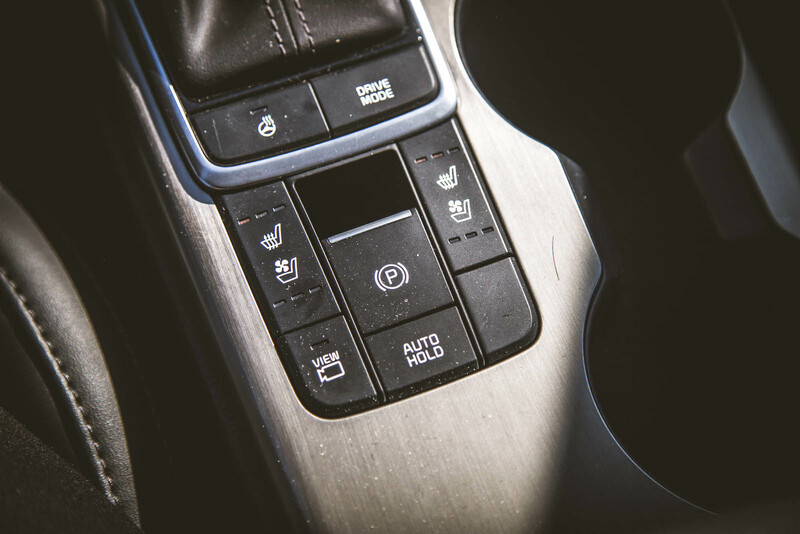 Oh, and not to mention, the Optima comes with many features that your Camry-driving neighbour probably has never even heard of, let alone knew the technology existed: 360-degree camera monitoring, rear window sunshades, Apple CarPlay and Android Auto, autonomous emergency braking, and a wireless phone charger (though many of these features are only available on the most expensive SXL trim). 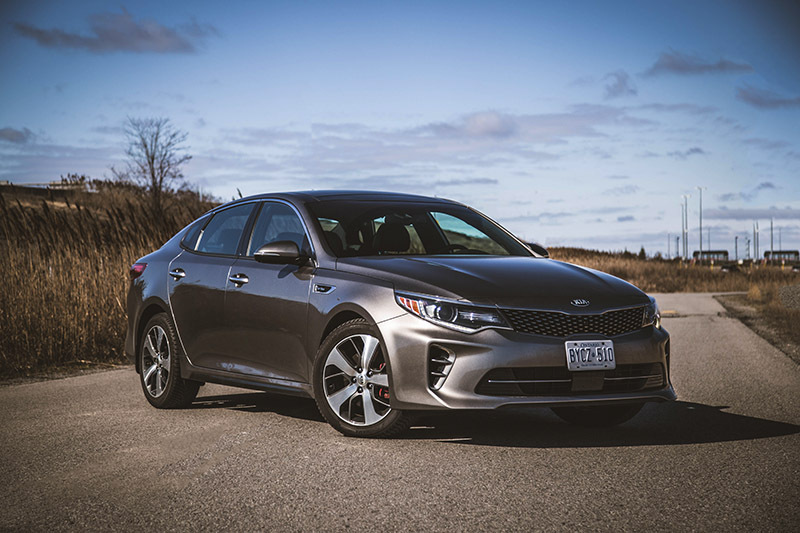 We have come away impressed by the Optima’s refreshed exterior design, luxurious cabin, and sheer volume of standard options, but where it lags behind the competition is with its powertrain. 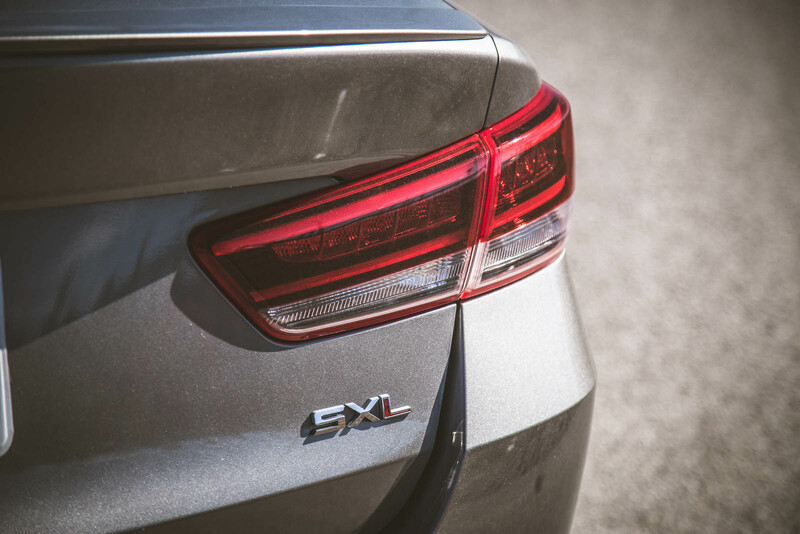 Our tested Optima SXL was equipped with the carried-over 2.0-litre turbocharged engine, but we found a large disconnect between the driver and the vehicle. 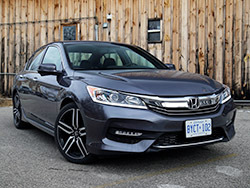 It could be due to the long wait-time for turbo spool, or perhaps the sluggish 6-speed transmission, but we never felt like we were one with the car. Acceleration was energetic once the thrust kicked in, sending 245 hp and 260 lb-ft to the front wheels, but the steering was unnecessarily numb and the exhaust noise was rubbish – quite a misleading exterior design without the sporty mechanics to back it up. However, the Optima does make up for it with applaudable road manners. 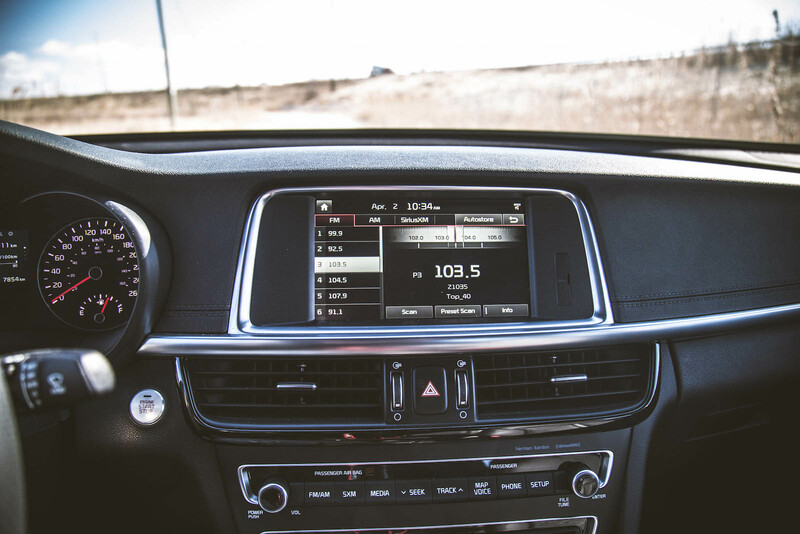 The cabin is largely devoid of any wind or tire noise, the ride is soft and calm, and the overall driving experience is serene and not too busy. 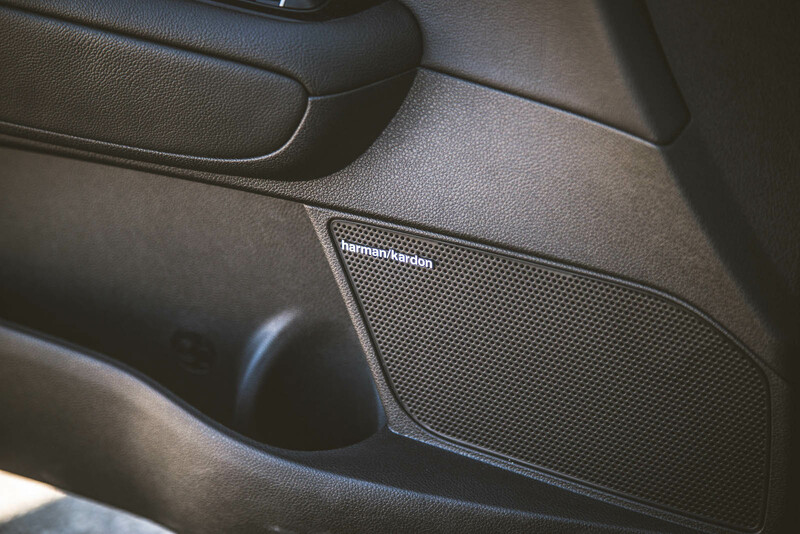 We didn’t hear as much as a squeak or rattle coming from the interior as well, so kudos to refinement. 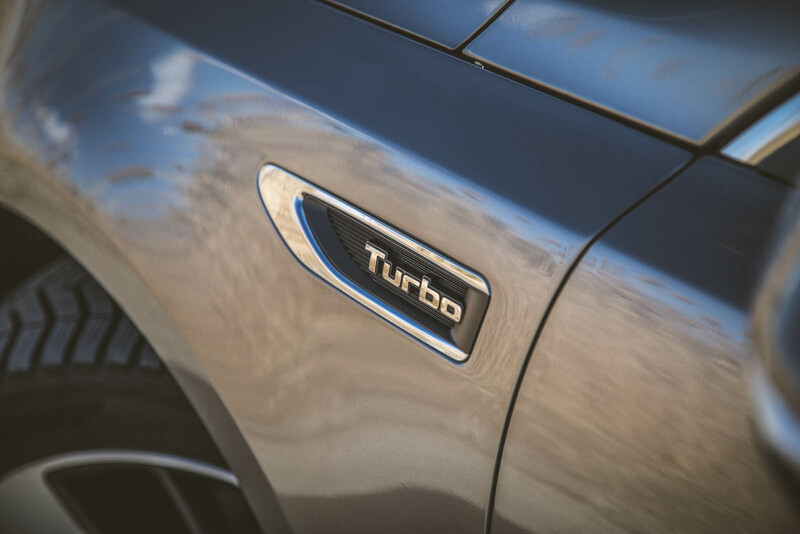 The Optima SXL also offers great fuel economy for a mid-size sedan loaded up with a turbocharged engine. We averaged 10.2 L/100km over our week, better than our scores with the V6-equipped Camry and Accord but of course, those sedans have two extra cylinders. The Optima does come with two other engine choices for 2016, both more fuel-efficient than the 2.0-litre tested here. This includes a carried over 2.4-litre naturally aspirated four-cylinder, and a brand new 1.6-litre turbocharged four-cylinder mated to a 7-speed dual clutch transmission (a first for the Kia brand). Unfortunately, we did not have a chance to test these latter two engines. 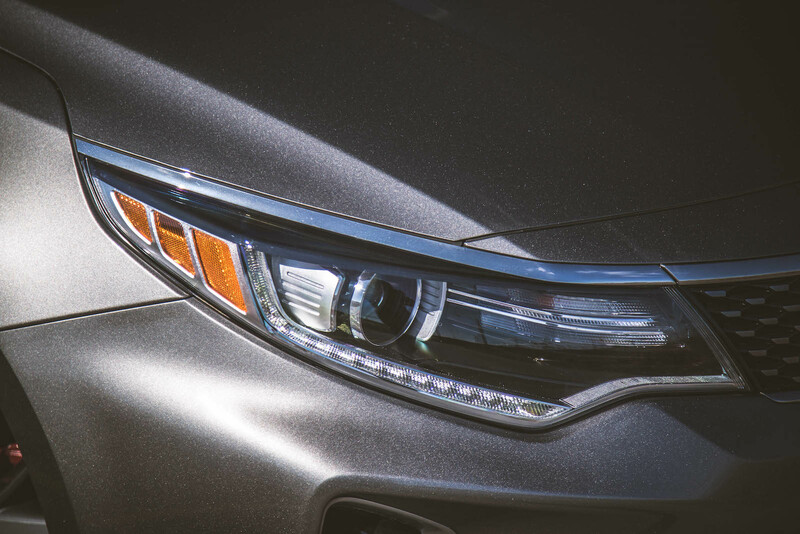 The Kia Optima is a cozy alternative to the ubiquitous Honda Accord, Subaru Legacy, and Toyota Camry. It offers a sharper looking silhouette that is more youthful, more dynamic, and punches well above its pay grade. Combined with a solid platform and a classy interior setup, it’d be foolish for young families to turn a blind eye. 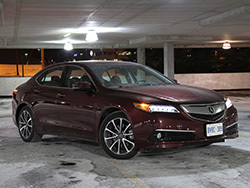 The fully-loaded Optima SXL may cost $3,235 more than the top Toyota Camry XSE V6 and $1,405 more than the most expensive Honda Accord Touring V6, but compare their options lists and you will understand why. Who knows, you might be screaming “value, value, value” just like we were.